Date of publication: April 08 2015 . 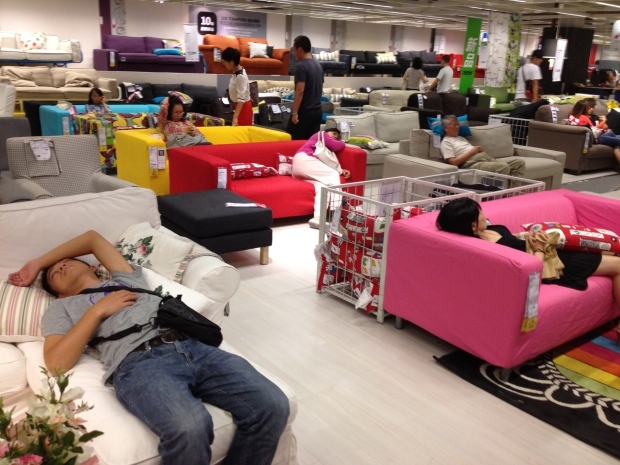 According to recent data of the Shanghai media guide IKEA shopping center, located in the Beijing, Issued a ban on visitors to sleep in the halls of the store. This decision is based on the fact that a large number of visitors have come to regard as the norm and come without making any purchases, sleep or just lie back and relax under the air conditioning. These events are actually exposed shop not in the best light and adversely affect its reputation, pushing potential buyers. Also received information on more misconduct visitors except unauthorized sleep. Maybe Josephine TorellWhich is representative of IKEA in China, had no idea where this will lead and allowed the visitors too much freedom of action, stating that they can feel at home in the company store. Among journalists and other media representatives already had doubts about the fact that the new rules will be met by Beijing residents for a long time they will seek nooks for a comfortable stay in the walls shopping center Swedish furniture manufacturer.